You may contact the Office to be placed on a waiting list. If you have worked with Bees Wax as a medium, you know what a creative adventure it is to paint, sculpt and carve this luscious material into your creations. 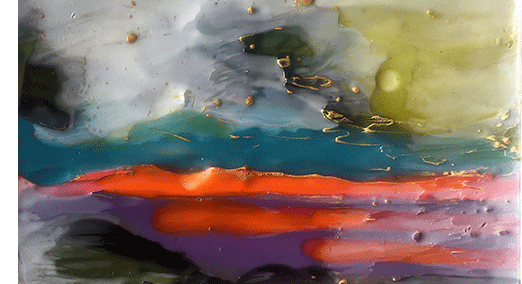 If you are curious about Encaustic and a beginner, this workshop will walk you through the basics and allow for time to create a beautiful piece ready to hang! Laying down layers of transparent wax. Mark-making using a variety of tools. Photo image transfer on encaustic surface. Bring a toner based photocopy and learn how to turn it into a decal while embedding it into the wax. that will create a bas-relief surface of colors. And of course, following your own art making experiments and discoveries! As well as using small boards for learning techniques, I will provide larger cradled panels for a final piece. If you are experienced and wish to work larger, feel free to buy a panel or bring a plywood base to work on. Optional: Bring images/memorabilia /small objects to collage into your work. Feel free to contact Karen if you have any questions. $110, $88 OHCA members. $20 materials fee. Materials fee to be paid to the facilitator the day of your class. Karen Meadows has been developing her encaustic art for over 10 years. Coming from a textiles background (MFA from California College of the Arts), she wanted more texture in her painting, so wax was a natural material to experiment with. She has developed a personal language and multiple techniques. After teaching drawing and painting at Redwood High School for 21 years, she is eager to share her process. She is passionate about guiding students through the creative process and has written hundreds of inspiring project lessons.